Every year we get closer to a world partially run by artificial intelligence. While its full potential is still unknown, there is no doubt that AI is already improving many aspects of our lives, including transportation, agriculture, education, commerce, and healthcare. While the future of artificial intelligence in all of these institutions is uncertain, we can make predictions based on the ways in which AI is currently changing them. 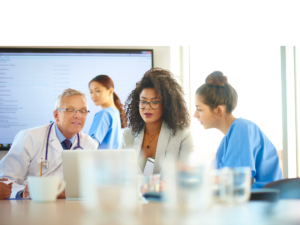 Healthcare providers have seen plenty of changes as a result of AI advancements, from improving the patient experience to managing and acquiring data. Here is how AI is changing healthcare in 2019, and how it may affect the industry moving forward. Helping patients is the main purpose of any healthcare institution or professional. Developments in AI technology are making it easier for patients to get the help they need when and how they need it. Artificial intelligence is built on gathering copious amounts of data and analyzing it in complex ways. By collecting textual information from several review sites, social media posts, and post-care surveys, Natural Language Processing (NLP) engines can find common themes and areas of focus for providers. This data can then be used to improve the patient experience. Even the best doctors, nurses, and surgeons suffer from human limitation. There are objects and patterns of development we cannot detect with our native senses, even with high-powered imaging devices. AI, however, using algorithms and data analytics, could possibly address nuances and predict outcomes that escape human awareness. Using this information, doctors could diagnose problems earlier, improving the lives of patients. Though still in the research and development phase, scientists are also looking into ways of using AI to help patients with neurological disorders communicate and possibly enhance motor function. By interfacing AI with the patient’s brain, these functions could be restored. Just as AI improves the lives of patients, this technology is making it easier for health institutions to provide the best care possible and promote their services. Medical professionals will face a wide variety of random scenarios in the field. Prior methods of training could only go so far in simulating these possibilities. With artificial intelligence, training protocols can more accurately replicate realistic scenarios based on natural speech algorithms. Students will face more complex testing situations that will better prepare them for the real thing. AI might also prove useful in patient data management. Rather than having to fill out several forms, process them, and dig them out, medical personnel could leave these tasks to AI-powered technology. This would give doctors quick access to pertinent data for each patient, and also save patients time and energy. New patient information could be quickly uploaded, stored, and analyzed by AI algorithms. This data could be used for early detection or prevention of certain illnesses, or for optimized treatment of existing diseases. AI solutions also help healthcare providers target the right audience. Providers can access metrics on how their marketing campaign is doing, who it is reaching, and how it can be improved. A solid brand promotion strategy also relies on maintaining a strong reputation online. Using AI, healthcare providers can improve their reputation and increase positive online reviews while finding and addressing negative feedback or malicious content. By engaging with all legitimate reviews, good or bad, providers enhance their brand perception, acquire new patients, and bolster patient loyalty. How Will AI Affect Healthcare in the Future? With so many advancements in AI occurring simultaneously, it seems that we are on the brink of a new technological age. Though we do not know what the future will bring, it seems AI will bring increasingly positive implications for healthcare providers and patients alike. Data-driven AI will continue to help doctors detect illnesses earlier than ever before, improve patients’ quality of life, and strengthen the bonds between providers and their patients, new and old. Researchers continue to work hard to overcome some of the implementation barriers of AI in healthcare.